Whoa! Your midichlorians are off the charts! We’d better start your training ASAP. 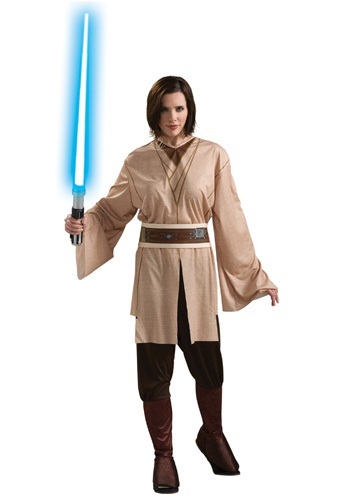 Of course, the Jedi Council needs to give us the go-ahead, but you might want to invest in this Women’s Jedi Costume anyway. Because these test results make it look like you could be the one to bring balance to the Force! And lately it’s been all out of whack, so you’ve really got your work cut out for you. We’ll spare you the long version, since you haven’t even had a chance to put on your robes, but things are getting pretty weird out there. Don’t tell anybody we said this, but we have a bad feeling about this Skywalker guy. And we keep picking up on some really weird energy whenever that Gungan ambassador is around! But hey: try to push all that stuff out of your mind. As of now, you only need to focus on you. That, and the huge network of tiny symbiotic organisms that links all life in the universe. Man, sometimes we forget how tough it can be to wrap your head around all this new Jedi stuff! At least you seem to have a knack for it. One quick thing: we’ve heard rumors about a collection of lightsabers in the lost-and-found at the temple on Coruscant. If you happen to see one that you don’t think anybody’s going to miss, would you send it our way? Thanks, pal! May the Force be with you!